The experience linked to this Article is in itself very significant. The Post was written after a first meeting in which they declared themselves enthusiastic about my ideas, and they asked me to deepen them (the Post was then published in “private” mode). But their response to the Post was that in reality they immediately have a strong need for new customers, and that therefore they would have been interested in a new meeting like me only in case I brought new customers. ● to check which is the mindset of the current Fab Labs (being sure that there are Fab Labs able to understand the need to innovate in a disruptive way). ● to stimulate people who are outside the “World of Fab Labs” to develop alternatives to the Trend Industry 4.0 – now developed in a naive way – starting from the basic qualities of the Fab Labs. Premise: only an introductory part, rather generic, of the Project is presented here. I am very happy to collaborate with ● those who want to learn more about the various parts of the Project; or ● those who want to adapt the Project to specific situations. The Fab Labs are part of that part of the Market that is now at sunset. Or rather the Fab Labs are the result of the concept of “convenience” of innovation developed by the Incumbents – who manage this sector – who fail to understand how in reality today the Market requires a radical innovation not only of the product, but also of business models (and therefore of product design, types of production, marketing, etc.). In general the problem is that today the new Demand requires a disruptive quality leap for the Business (the Customers, with the current recession under way, can no longer afford to buy products of the current generation, and therefore radically innovate the offer is not an option at all). More specifically the problem of the Fab Labs is that they represent fake-trends with which the “traditional” Market operators recycle their obsolete Culture “taming” the drive for innovation (“behind” the Fab Labs today there are Companies who have achieved dominant positions on the Market at the local level – Consultants who take advantage of the desperation of their clients, who trust those who sell, in an elegant way, hopes – Professors, Journalists, media operators who are accustomed to ” follow the wave “). That is, the pseudo-innovation underway is based precisely on that Market Culture which is responsible for the current recession (first of all, work is carried out to sell advice and final products based on the emotional level; when the new Demand requires new forms of value instead- utilities). Actually, within the Fab Labs, there are great innovators like the creators of hardware like Arduino. But, as can be seen from the winning disruptive innovation cases, the technology itself does not serve to create the value required by the new Demand. And the Fab Labs, precisely, use an obsolete way in employing technologies that can potentially develop winning products in the emerging market. The problem produced by the obsolete approach developed by the Fab Labs does not prove to be solely an own-goal for operators in the sector; but it creates a situation that makes it difficult to leave the recession. The fact is that the Incumbents that work with the Fab Labs try to maintain the status quo in their favor (with pseudo-innovation that in reality does nothing but attribute a new image to obsolete products), and in this way they keep out of the Market who instead would have the ability to bring real innovation to the territory. 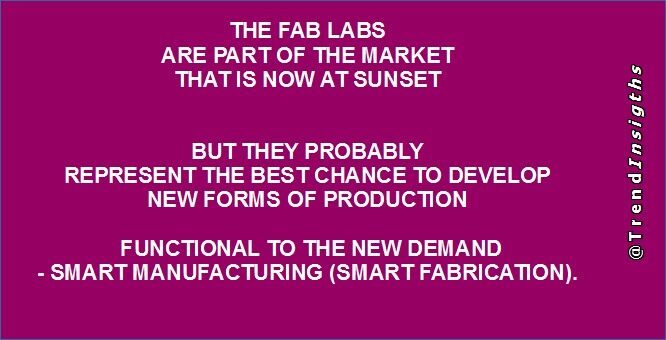 If the Fab Labs have no future (they are used solely to gather support and funding from the Public Administration, and the Foundations), they probably represent the best chance to develop new forms of production functional to the new Demand. This Article illustrates, precisely, how an evolution of the FabLabs (here defined as SmartFAB) is actually a response to the current pseudo-innovation of Industry 4.0. The production method “Industry 4.0” is, in fact, one of those forms of pseudo-innovation created by the incumbents (managers and Consultants) in order to survive the recession. to define winning strategies in the nascent market. The problem is that although – in theory – the operators of the Fab Lab world should be in the best position to develop forms of fabrication in the near future (diffuse factories, trasplanting, integration of Customer in product design, etc. ), in reality they they have a mindset strongly structured to the Market now at sunset, and they are – mostly – people who are less open to real innovation. starting from the basics of the current Fab Labs. It is first of all necessary to consider that we live in a Disruption Age°. And that therefore adapting one’s approach to disruptive methods is not an option. It is the “objective” situation of the Market that requires it. A situation that was not decided by someone, but that was spontaneously created in our Society due to some “objective” factors that make it necessary to adapt to them. The ongoing transformation is radical, disruptive, “revolutionary” as it was, for example, that induced by the industrial revolution. Everything changes radically, and a virtuous process takes place in which every single small change generates further changes. And for those who cannot adapt, there is no place in the market. it is truly radical, “revolutionary”. Those unable to make the leap into the new dimension remain outside the Market. It is a leap in which it is necessary to radically change one’s way of thinking, one’s structures. (in this way, they paradoxically try to solve a problem with the same mentality, the same ideas that produced the problem). that instead of favoring change, procrastinates the change. In this way creating problems not only for those who want to introduce real disruptive innovation into the market (ie new values that are really useful for the Customers). But also creating the conditions for its own failure. The fact is that this condition of the Market created by the Incumbents is also a condition that turns out to be an opportunity for those wishing to enter the Market with truly innovative products (those who are able to correctly interpret the Trends). IMMEDIATELY OBTAIN THE CONSENT OF THE CROWD. One of the problems produced by this culture is the misunderstandings about the factors of innovation: misunderstandings that must be clarified if we want to be able to develop strategies that are truly functional for the nascent market. In some of my documents we try to clarify this aspect of the current Market Culture. The essential characteristic of disrutpive innovation which is the basis of the emerging Market (perhaps the most important mega-trend) is crowd-ization. In other words, after years in which the “institutions” (the Market and the Government) have “induced” in the people “artificial” needs instead of trying to satisfy real needs, a situation has been created in which the unmet needs have created a condition of intolerance such that a change of direction can no longer be postponed. (both for the Market and for the Government area). More specifically, the fact is that we have gone “against nature” in the satisfaction of the real needs of human beings, coming to force consumers to buy unnecessary products (the “compulsory purchase”: like cars and appliances that go “out of standard “). And now people, short of money, can no longer afford to buy products of the current generation (not strictly necessary products). ● despite all the efforts to “guide” the Crowd in its choices, the law of “freedom of choice” still applies: and therefore Governments and Market Players who do not want to adapt to people’s new needs are punished. ● there is still a “circular economy” at the base of everything, so that when there is no money in the pockets of consumers (due to taxes, forced acquittals, lack of work – a problem which, in turn, derives from the incapacity of sell products) the Market enters a phase of recession. ● serious problems for people for whom there is still no solution. ● new expectations of Consumers linked to the awareness of what the new consumer technologies, and the new Practices connected to them, can do to solve these problems. In summary, this is a radically different New Demand than the one the Market is used to dealing with, which requires a totally new approach. That is, today it is not only necessary to revolutionize the concept of the product, but it is also necessary to revolutionize its structures (upstream of everything, it is necessary to revolutionize one’s mindset). THE CHANGE REQUIRED BY THE NEW DEMAND. the new Smart Fabrication methods. ► the reduction of spending (by Customers, Companies and Public Administration). In other words, the recession leads to the impossibility of spending what was previously spent: this forces the Market to search for more sustainable solutions (as purchase, management and maintenance). 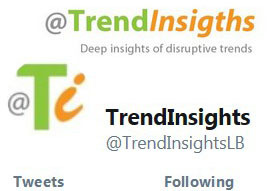 ► customer technologies (“low-cost °, costing just a few dollars) are now more functional to the new phase of the Market than hi-tech (costly in purchasing and management). Today that is the low-cost technologies (those inserted, for example, in a 30$ SmartPhone) offer greater capacity to satisfy the new demand than the technologies just released on the Market. ► the request by the Customers to develop a truly sustainable innovation. That is, customers require products that make their lives sustainable; but also sustainable products, that is accessible in terms of purchase and management costs. The quality of life has deteriorated (with in some cases tragic consequences), so today there is a strong demand for solutions that can improve urban life (solutions, for example, for Smart Cities, Smart Housing, Smart Mobility) . It is, in particular, the decentralization of production. ● the new needs of the Customers have characteristics that make it necessary to have a more direct relationship between the Customers and the Producers’ processes (see the question of product customization below). ● objective needs: the problems of transport and pollution costs lead to the need for a “localization” of production (at “Km Zero”). ● opportunities offered by new technologies (such as “Makers” tools, the possibility of producing parts starting from files, remote intervention systems, etc.). One of the appeal of this transformation is that those who want to enter the Market by developing real disruptive innovation are favored by the fact that the big players of the current market (the Incumbents) are not able to make a real change, and therefore will be replaced by new types production/distribution (such as distributed production – network of co-suppliers). IN A MIX OF MEMBERS/PRODUCERS OF PARTS. It develops up to new forms of production in Franchising (the owner of the product project grants a license, sends “the files” and intervener, possibly “remotely”). <see Transplant factories, in “Manufactory 4.0 e Franchising-Transplant Factories” in “Manifesto of Innovation (2): Innovation in the new post-industrial Market” >. The flexibility and ease of installation, management and modification of the “production lines” (and their extreme cheapness) allows companies to very quickly create “from scratch”: this makes it possible to follow the Demand in “real time” (take into account that in the new dimension the investments are not very high, also thanks to the possibility of self-producing the equipment, and to rent them). In Smart Manufacturing mode it is even possible to create temporary production workshops, taking advantage of the availability of “sheds” no longer used by the traditional industry (renting the equipment, the creation of a Smart Workshop is not much more demanding than setting up a complex event) . The characteristics of the new forms of production allow companies in crisis to recur with new types of products: take into account that the new production methods are based on creation, primarily at the local level, of groups of companies and professionals that can now operate in highly integrated way (thanks also to new logistics management software and production equipment connectivity). and by hiring and selling equipment developed ad hoc. it is necessary to develop a truly disruptive innovation. As mentioned above, developing radical forms of innovation of the current generation of products is not an option, since in the current phase of the market the changes are driven by objective – inevitable – needs of the Customers who can no longer afford to buy products of the generation current (non-disruptive product). That is today it is necessary to develop an innovation that is able to follow the new mega-trends, which are radically different from the previous ones. when times would require profound changes (they would require a real, profound innovation in the first place of the Business paradigm). (basically the crises that periodically afflict the Socisty (and the Market system) are due to the fact that we try to solve a problem with the Principles, models and tools that created the problem). A significant example of this is the current concept of Industry 4.0. That is a (fake) Trend in which we think we can innovate the model of industrial production, when in reality we do nothing but re-propose tools and methodologies of the Market phase at sunset (for example, we rely on the cost-effectiveness of the new systems, but this direction implies a worsening of the situation <see The misunderstanding on: “low-cost” is disruptive innovation>). The Trends. unlike “vogues” (which are induced top-down), they are bottom-up phenomena. Obviously the incumbents, who try to maintain the status quo, in the moments of disruption they appropriate the nascent culture, and “tame” it in their favor. ● it is not a “technical” issue (for example, of “digital tranformation”). ● it is not – as seems to be the case in the “Fab Lab world” – the development of “ephemeral” products (gadgets, “fashion” furniture, etc. ): this is the typical concept of the current market, of the product sold “on an emotional level”. Today, utility products are needed, which represent a disruptive leap compared to the generation of current products. As illustrated in the previous chapters, the current problem of the Market is identified, in an error of interpretation of the current Trends, not only by the Market Players who think they can recover sales success by applying the old paradigm; but also by those who try to make change (in this category we must include the great majority of Consultants). based on the old mindset. In short, that is to say, today we mistakenly think that the change consists in improving the efficiency of the current production methods (seeking better performance and greater economies). In other words, the focus is placed on factors that are undoubtedly important, but which have no decisive importance at all for developing the transformation necessary to face the new market. And by doing this we lose sight of what underlies the disruptive change underway: the ability to grasp – better than what has been done up to now – the real needs of consumers. in which the essence of the current business model is changed. HUMAN QUALITIES OF THE MARKET. That is, the demand is the most valuable development for the user, which means re-evaluating the human factor in the product design phase. At the base of everything it is a question of recovering the entrepreneur’s sensible intuition (ie it is a matter of adapting again to the Law of Supply and Demand). In reality today it is possible, thanks to new technologies, to do more: to bring within the product development processes the Customer. One of the mega-trends on which it is necessary to tune in is that of “localization” (Glocalization). This implies, precisely, an abandonment of the focus on the “technical” aspects of product development. For the entrepreneur to deal with the technical aspect of his instruments is no longer necessary because now the performance of consumer technologies is more than enough to develop new products able to satisfy the new Demand (this also applies to the professional Demand, like the instruments of Smart Fabrication). In other words, the great misunderstanding that is at the base of the Market is that to satisfy the new needs of the Customers it is necessary to improve the technologies of the product (and of the production phase). to develop a new Value that meets the current Demand. ● Entrepreneurs can develop their ability to imagine the product, organize effective ways of producing it, without having to deal with technical aspects for which they must “study” new concepts. And without having to rely on the intermediation of “technicians” for the use of production and communication tools (this is possible thanks to IT and IoT and related new practices). That is, in the new dimension it is necessary that the tools that the entrepreneur uses return to being of the same kind as the instruments used in the phase prior to the digital transformation. ● they are the ideal users for the new production methods (precisely because the figure of the entrepreneur still exists in it – be they realities that have been operating for some time, or new small Start ups – while the medium-large companies are almost all in the hands of Managers and Consultants, with whom it is impossible to develop real disruptive innovation <see The great Firms are not able to develop disruptive innovation within them>. ● they are not yet served by Innovation Consultants (who for now are dealing with the “fat cows”, a little because they are attracted by the level of the typical parcels of that dimension; and a little because they are not really able to offer a real innovation that can allow us to develop functional production types for the current market). PRODUCT IDEATION / PRODUCTION / DISTRIBUTION. It is therefore necessary to develop an innovation that makes its mindset and its structures functional to the new Demand which requires new ways of satisfying needs that the current generation of products is not able to satisfy. The next two chapters describe a production structure that is particularly functional to the current disruption times: the SmartFAB. It is a radically innovated “Industry” method based on emerging mega-trends such as “Makers” manufacturing, participation of the Customer in product creation, a widespread factory, etc. The SmartFAB outlined here represents an evolution (radical) of the current Fab Labs, which, while adopting many qualities of the new market culture, remain anchored to the business models of the Market currently in crisis. Which makes them intrinsically unsuccessful: like all fake-trends, the Fab Labs can, at most, exploit the “novelty effect”, and emotionally involve some customer groups (B2C and B2B). But they cannot cope with the wave of ongoing disruptive innovation. The current Fab Labs are born to satisfy, in the B2C, ephemeral desires of DIY. And in B2B, the Fab Labs attract customers without a culture of disruptive innovation, who perceive the desperate situation of the pre-disruption business and rely on anyone who can tell them a “good word”. WHO HAVE PRODUCED THE PROBLEM! That is, the Fab Labs continue to insist on “innovation” directions that are actually obsolete formulas that are not at all able to bring their customers (2B) to realize effective production methods. In fact, the current Fab Lab uses a typical approach of the pre-disruption market, that is, among other things ● “digitalization” of the production tools (the form of technology that has been applied in recent decades, and which led to the current crisis ) ● leveraging on the emotional aspect (“gadgets”) when today it serves, on the contrary, the development of a new useful value for the Customer ● top-down imposition of product qualities, when the current situation requires a Customer-driven dimension ● scheduled obsolescence when customers are no longer able to continually buy new products to replace products that fail after short periods of operation. There are many radical (disruptive) changes that the current Fab Lab dimension must develop in order to arrive at a truly competitive model. This document analyzes many aspects of this change. In the first place, a new generation FabLab must develop an integration between two forms of offer to the Customer on a different level from the current one. ► “hard” activities: rental of equipment to be installed at the Customer’s premises, or to be used within the SmartLAB. Following are some notes on the possible directions of the development strategies of the new business by a SmartFAB. factors that remain the fundamental point of the business. This simplification does not lead to a reduction in the offer; but rather it becomes a plus, since it places the SmartFAB customer in a no-hassle dimension, in which it is free from the stress of having to subordinate its entrepreneurial creativity to technical matters. This increase in the potential of the system linked to its simplification is due to the fact that in such an approach a “reductionism” of technological qualities is not applied. But the technological aspect is relegated to the “invisible” level of which the Entrepreneur must not occupy (nor, in this new approach, the entrepreneur is forced to serve “technicians” as intermediaries for the definition of production lines, and for their use – which means better development of entrepreneurial creativity, and greater fluidity of the production flow). What does “simplification (friendlization) that improves the quality of the final product” mean? To clarify the concept of “simplification” (friendlization) of the Offer suggested here, it is necessary to remember how to manage a car in the early 1900s it was necessary to be a mechanic (also to carry out daily routines); today, on the other hand, a person who is completely lacking in technical knowledge can manage a car in everyday life (and when there is a problem this is signaled by the display, and we turn to assistance). As far as the User is concerned, in the case of modern cars, in fact, there is a “simplified” technological system (an absolutely friendly, techno-illiterate proof system). The car in our example is, in fact, equivalent to the type of system it is dealing with: if it is decided to use the “technological system” constituted by the car, for example, to perform a delivery service in the city, in in this case it is not necessary to have constant technicians available to manage and maintain the vehicles. It is clear, moreover, that if to perform this service there was need for the presence, next to the driver, of a “technician” to make the car work, and to direct it in his routes, the entrepreneur-driver would be very limited in using the car’s features, and in setting the routes (its Business). This happens because the car is built by assembling consumer technologies, or rather those technologies that are now considered low-tech, available at low prices, and manageable by a workshop anywhere in the world. MADE WITH THE SAME CONCEPTION OF THE CAR. Obviously it’s not all that easy: to obtain such simple production systems today, unsustainable investments from a reality like a Fab Lab would be necessary. That would be possible with the support of huge funds; but this would not be desirable since, since it is literally a matter of inventing a SmartLAB dimension, it is much better to act with relatively small steps. However, we can already approach – very much – this level of “simplification” (friendlization), guaranteeing the customer a basic system setup; and intervening in the operational phase remotely. Keep in mind that in reality the products and production systems designed according to the principles of disruptive innovation are actually much easier to manage than current cars, since, among other things: each element has a display that illustrates how it works; the “central brain” allows a very simple programming; the system is highly modular, and can allow remote interventions by technical personnel. In summary: the production system proposed to the customer must be extremely friendly, that is a system belonging to the Makers philosophy. And not an “Industry 4.0” system, which reproposes the same paradigm that led to the current Market crisis: the new system must be developed with an effective disruptive innovation approach, which, thanks to the simplicity of a SmartPhone, allows in the first place to the Entrepreneur and the Startupper to focus exclusively on the already challenging task of developing product and production in a way of radical. It also allows the business to be effectively connected, with the other Value Web operators and with the Customers (who, in the new Market, must be integrated into the Product conception and production process). Furthermore, the system installed at the Customer must be able to be modified (very quickly) to be able to develop different productions: its modularity must allow the insertion of new elements on the fly (which can also be hired). But also to integrate pieces produced in other locations (such as at the SmartFAB site) in the production flow, being connected to them. ● having to deal with technical issues in a solution that declares itself to be of the Makers type does not in itself have a sense, since in this way the initial intentions contradict each other: the mode in question is a modality – from the point of view of end user – avowedly Do It Yoursef (that is to say instruments of the “Black & Decker” type). ● on such “technological” level one would start as losers towards large consulting companies. to work with technical personnel. For this reason it is precisely necessary to develop a “turnkey” offer in which the “technical” aspects are treated, in a painless way for the Customer, with remote assistance interventions. ● direct production of disruptive innovation products: it is possible to develop advice for customers who want to activate the production of new products in a particularly profitable way for the SmartLAB, creating a partnership on the marketing of the product that develops with the customer. In this case it is necessary to reformulate the strategies of approach to the customer: instead of promoting their own consulting activity and waiting for the customer to show up, it is above of all to identify a type of product for a specific market sector, and then search companies with which it is actually possible (and profitable) to create partnerships to produce this product. [see below]. ● “Crowd production”: bearing in mind that one of the mega-trends is the co-operation of the Crowd in the design of the product (User Driven Product), it would be necessary to open the SmartFAB to the collaboration of the Crowd. It is necessary to create the technical and legal conditions to create partnerships on products designed by Crowd. ► a substantially innovative offer of (Digital) Smart fabrication, in which the Digitalization/Makers has evolved into “production lines” of Smart Manufacturing. That is going much further than 3D printing; offering Smart Machinery integrated in an Open System: real production lines of a radically new type (connected, therefore widespread in the territory) that can be implanted at the Customer (sale or rental), and integrated with lines present in the SmartFAB (see also FabHangar and Mobile Unit). ● a real Smart Manufacturing (Smart Fabrication); and not Industry 4.0, which is by no means a functional innovation for the incoming Market. That is, it is necessary to develop a Smart Manufacturing with really Smart and Connected systems, which propose a real “DIY” dimension typical of the Makers concept. – because the companies of the upper market segments are managed by managers, who are too tied to an “incumbentes” mindset (of the previous market), and would not understand the offer (these would be failures in themselves: “money immediately “, but bad reputation). – because the range of small / micro industries is still managed by entrepreneurial figures, who are the only ones able to successfully develop disruptive transformations of the Company (we remind you that it is not only a question of transforming production, but for them it is also need to change the business paradigm). We must also consider the mega-trend of the widespread factory indicates how in the future the current big players of the market will be (mostly) supplanted by networks of small industries. Obviously to develop this type of activity, which is interested not only in indicating new production methods, but also in a change in the business model, it is considered necessary to involve large (or “average”) consultants. It is a matter of acting carefully, since it is necessary to find a consulting company that is really able to understand (at least in part) the disruptive innovation. This approach offers a mutual advantage for the SmartFAB and for the consulting company: the SmartFAB learns enough to be able to continue (even) alone; and the Consultancy company acquires a competence in the field that it does not find “on the books” (probably it ends up thinking of being able to continue on its own, but in reality it is difficult for it to actually change its mindset: it is more likely to create spin-off with joint participation of big Consultant and SmartFAB). Some considerations on the activities of a SmartFAB are developed below. Today it is necessary to move on to propose (and first of all develop) a real, substantial innovation, which allows the Customer to move to a new phase from the point of view of mindsets, methods, processes and structures. An innovation that allows us to meet the demands of the New Demand °, allowing us to arrive at conceiving – and producing – products radically new in their value, in the methods of use. Products that present a truly “revolutionary” value for the Customer. (both for the customer-producer and for the final customer). ► develop a complete consulting activity (360°). It is a question of providing advice that puts the customer in a position to develop a radically new business; and that therefore covers every aspect of the business. For this reason it is necessary to integrate skills and expertise not present in the SmartFAB core. For this purpose it is necessary to resort to a Partnership (for example big Consultant). ● the possibility of a real transformation of the mindset, and of the structures: the Customer must not be trained to face the “digitalization”, but to face the Market characterized by radically new forms of value (the fundamental point is the radical change in the product concept [see below]). ● the ability to manage completely new production “lines” (and a value chain). The consultancies of the SmartFAB are in fact workshops for the Client; and it could not be otherwise since it is not possible to explain – “in theory” – to Clients what disruptive innovation is without bringing them to act directly (leading them to have to strive to apply a new business model, and to actually have to design new production lines). This applies at least to that part of customers who are not “students”, but must deal with the real market: they can obviously remain “consultancies”. In other words it is a trans-formation and not a training. Basically, notions are not induced in the Client, but it is guided in a practical path in which it elaborates a new awareness of what it needs to face the new Market. WITH A LEARNING BY DOING APPROACH. (the action of Consulting and “Training” are integrated). TEACHING TO REASON IN A DISRUPTIVE WAY. That is to say, it is about transforming the Customer’s way of thinking, so that it is more suited to the times. on the technical aspects, on digitization. (at the level of production and product). (the technical aspects are obviously decisive, but they must be passed to the Client as something that it must not – necessarily – take care of: its focus must be able to remain on the level of the Business). ● on the qualities of the new modes of the production process. A consultant who prepares the customer for the new Market must also overcome the dichotomy entrepreneur/”technician”. One of the problems of the pre-Industry 4.0 Market is precisely in the presence of “technical” personnel who act as intermediaries between those who must develop value and the instrumentation. This is precisely a problem because in this mode the entrepreneur’s creativity is often oriented and limited by the vision and the skills of the technical staff (for example with “you can’t do it”). It is therefore determined that the instruments proposed to the Client – and therefore the training – put the technical questions on a hidden, underground plan (of which the Customer does not deal): the instruments must be friendly, with tablet-like interfaces. To get a real transformation of the mentality it is a question of operating starting from, and remaining on a “practical” level (this is particularly true for entrepreneurs of the previous generation). ● the characteristics of the New Demand, and therefore what are the characteristics of a product that must satisfy this Demand. ● how the new potential of Smart Fabrication systems can allow the creation of this type of product. Obviously there will be courses and manuals, but the “digestion” of the new culture takes place at the practical operational level of the various stages of conception, design and production. Above all, the entrepreneur must be led to adopt a new Business model. This means, given the characteristics of the new market, a new approach to the definition not only of the product, but also of the relationship with the Customer. A fundamental point remains that of helping the Customer to change mentality with respect to the management of the Company more generally, as in the choice and in the relationship with “the staff”. But this is a delicate issue, more linked to an intervention of motivational psychology (in any case this type of competence should also be incorporated into the SmartFAB, in partnership). Legacy product is a provisional term: this term indicates a new product that represents a new generation with respect to the previous products (Legacy is understood in the meaning “follow the footsteps” – probably better terms can be used, perhaps “lineage product”). In this way, by focusing on the product, the Customer becomes aware of the characteristics of the new business model that must be adopted to face the new Market. ● is compliant with the new principles of the Market. ● is developed according to the Vision/Misson of the Company. In short, it is a radically new product that is in harmony with the original entrepreneurial philosophy. We are talking about a sort of “spin-off product” that could be called Legacy product. 1) going upstream of everything – at the origin, on the Company’s reasons for being – to clarify the fundamentals of the entrepreneurial Vision (it is a question of re-developing the corporate Mission). 2) resume the product design process, but this time with the new parameters (the New Market Principles). In other words, it is a matter of undertaking a new path taking into account the new possibilities offered by IT and IoT; and by the new practices spontaneously developed by Crowd. This is from the point of view of Production (the production lines made of Smart Tools integrated into a single Innovation Ecosystem° which also includes parts external to the Company) and from the point of view of the Product (the new utility values). The New Demand° requires new Values°: it is therefore necessary to develop a Value-oriented innovation° able to develop Useful Value°. It is necessary to bring the Customer who it is often far from the possibility of conceiving a functional product for the new Market, to develop a product of value – it is considered necessary for the SmartFAB (especially in a first phase of activity) to reverse the approach to the Customer: instead of promoting its own activities to induce the customer to use the SmartFAB, we try first of all to develop a product concept for a specific type of market. And then we contact a customer to propose the advice that includes the production of a new type of product (evaluating with attention to the qualities of the potential customer). (obviously it is a matter of stipulating contracts that allow TFL to continue consulting in the same sector as the first customer, proposing the same product meta-concept). This approach allows the Legacy Products described elsewhere to be developed (and marketed in partnership with the Customer). Obviously the “traditional” consultations can continue to exist. But in this way the profitability of the intervention is enormously elevated – since there is a return of the profit produced by the Value that is made, with the advice, of the Client’s Company). ● are ideal users for the new ways of production (precisely because in them the figure of the entrepreneur still exists – whether they are realities that have been operating for some time, or new small start-ups – while the medium-large companies are almost all in the hands of Managers and Consultants, with whom it is impossible to develop of real disruptive innovation <see The great Firms are not able to develop disruptive innovation within them>. Consultancy must be complete (360°). In other words, it is necessary to indicate to the Client not only new production methods, but also a Business model change (it is essentially a business strategy consultancy, in which, obviously, a decisive part is the production method). (essentially whit the big consultants). It is a matter of acting carefully, since it is necessary to find a consulting company that is really able to understand (at least in part) the disruptive innovation. ● the consulting firm enters the field of innovation in which today it does not have the qualities to enter. And in this way he acquires in the field a competence that he cannot develop in any other way (in my opinion there is no danger that they can continue in this new sector with their own legs: even if they wanted to do this, they would be handicapped by their obsolete mindset: they are more likely to create spin-offs with the participation of SmartFAB). The Services of the SmartFAB are obviously (mostly) an extension of the consultancy (Consulting and Charter are two integrated activities). Or rather it is about putting that company in a position to create a new value. ● instrumentation to be used upon the Customer’s site (also with a mobile unit with pre-assembled machinery [see below]). In essence it is a matter of providing an assembly line (or parts of it) that integrates with the pre-existing instrumentation. ● instruments usable at the SmartFAB (FabHangar) site. Therefore the site must be equipped so that it is possible to connect the instruments both between them and with the outside. In large part this is integrated into the activity of Consulting. This modularity guarantees an easy and quick modification: by assembling different components it is possible to obtain completely different products. And also quick repairs. ● Open connectivity: the system is open to connection with the “outside world”: Partners that are part of the Value Web (of which the SmartFAB is a part) and Customer. This is followed by an in-depth study of some points set out above. The production system offered must therefore be Open. Among other things, it must be integrated with pre-existing machinery (one of the services offered is the “digitalisation” of such machinery). It is necessary to develop the offer gradually, starting from a basic level, to evolve towards a more complex and sophisticated offer. The system supplied to the Customer is Open in the sense that it can be inserted both upstream and downstream (we should say “in parallel”) co-suppliers (including SmartFAB), and Customers. It is also, when the Customer produces under license, to be able to interact with the “parent company” (which in addition to sending “files” must somehow interact with the production). It is necessary to take into account that in the new Market phase the supply chain changes radically (as the gurus say, it turns into Value Web). The change is disruptive: it consists substantially in the transformation of a linear structure into a branched structure. This is due to the fact that the product radically changes first. A – the production path no longer leads to a well-defined product, but to a product that can have an almost infinite series of variations (one of the characteristics of new products is to be highly modular, so that assembling different components you can have products very different). This entails the need to integrate many suppliers in the production phase of the product (the new factory becomes a mix of transplants and a manufacturer of parts in “Makers” mode). One of the mega-trends of the market is precisely that of production aimed at the specific customer; is an evolution of the first level of customization introduced by Toyota some decades ago; now characterized by very different qualities, which allows it to go beyond mass-customization. In the new market, the Customers actually become part of the new form of Value Chain. ● new expectations of Consumers: which gradually increase awareness of what new technologies (and the new practices associated with them) can do to satisfy their new needs. ● Evolving needs: in times of rapid change, the needs of consumers are constantly evolving (new needs are moving targets). THAT REQUIRES A TOTALLY NEW APPROACH. Due to the fact that the new needs are constantly evolving (moving targets), it is necessary to integrate into the product design process the Customers, who are the only ones to know the real time what needs to be met (in this way it is reversed the principle of current “push” marketing, which leads top-down people to buy a product). In order to develop these new products it is necessary to revolutionize not only the concept of the product, but it is also necessary to revolutionize the structures of the company (upstream of everything, it is necessary to revolutionize one’s mindset). This is the Corwd-driven production in which the production systems open to the collaboration of the Crowd. ● a component of the System sold/rented to the Customer dedicated to the interaction of the individual Customer. ● SmartFAB must exploit the opportunity offered by this mega-trend, opening its structures to the collaboration of the Crowd, arriving to enter into a partnership with some “inventors” for the production/marketing of specific products. The Crowd integration system can be evolved from an initial phase in which the interaction of the Customer is minimal (for example, a menu of options is offered), to a mature system in which the Customer interacts in some way with the design . Some examples of how “unique pieces” can be produced. On a functional level: in orthopedic prostheses (external, removable), it is possible to have a precise adaptation to the limb. For containers (suitcases) for instrumentation it is possible to have an interior modeling based on the elements that the Customer must insert. At the “ephemeral” level: a manufacturer of clothing accessories – such as an eyewear manufacturer – can create unique pieces for the customer (via a dedicated interface). But it can also develop products with a retailer (for example, resort retailers modify the base product to link it to the image of the location). But the variations of this mode of production are endless: custom-made clothes and shoes (both in terms of size and the fabrics and leathers used). Car interiors, etc. Of course the same goes for B2B, both with the private and with the public (see below). In order to enter the market with “Fab Lab” strategies, it is necessary to differentiate them in a bricoleur dimension, and in an “industrial” dimension. And in particular develop the latter more. This is the most widespread dimension, therefore, with considerable competition. The FabHangar is proposed, which represents a more industrial dimension than the current one of the Fab Labs. ● in connectivity, which allows, among other things, an integration with the Customer’s systems. It is therefore primarily a question of having a large space (not necessarily peripheral, since today there are many unused industrial buildings). The structuring of the instrumentation is very flexible, like movable machinery (they are probably connected via wi-fi). And trolleys that allow the movement of semi-finished products. There must be secluded areas (the view of which is covered by “screens”) for the “privacy” of the Customer. ● adapt the equipment of the company that shares in a certain standard: firstly by making the equipment connected (so that the instrument can also work at that company as it is connected to the customer’s production line – and with the SmartFAB). One of the next steps may be to rent a mobile unit. This unit can be very useful for productions that last a few days. Note that in this way the SmartFAB makes the most of its rental products, as no hours of assembly and disassembly are lost. The mobile unit can be built very economically, even on a normal trailer for car (you find used at the price of $ 2,000). On this trolley a folding structure can be easily installed (there are thousands of examples on the Web) that can be quickly expanded to create a space of 8×8 meters (it can be prepared ad hoc in the SmartFAB with the machinery used for the intervention). The unit can be placed in the customer’s yard or shed (connections are made via wi-fi). This unit does not need a “direction” on site, because the operators can operate remotely from the office (or from the SmartFAB).